Apple’s new iPhone, iPhone 6, offers quite excellent video watching experience with its high quality screen display and audio output. Many users would like to watch movies on iPhone 6. But the problem lies in the format issues. Many movies are not accepted by iPhone 6 like MKV, FLV, etc. Since then, converting videos to iPhone 6 compatible videos would be of great importance. Leawo Video Converter Ultimate offers fast and smooth video conversions for users to convert videos to iPhone, iPhone 6 included. This guide takes converting Christmas movies to iPhone 6 as an example to show all iPhone users how to convert and watch movies on iPhone. To play movies on iPhone, you need to know whether the movie format is compatible with iPhone, therefore it is necessary for us to make clear what file formats are supported by iPhone. The table chart below shows you the detailed information. Let’s take a closer look. As we can see from the chart above, iPhone supports H.264 video and MPEG-4 video in MOV, MP4, and M4V file formats. To copy video to iPhone and play video on iPhone, we need to convert video to one of these three iPhone compatible video file formats. Additionally, attention should be paid to iPhone compatible audio file formats as well when converting videos to iPhone. After we figure out iPhone compatible video and audio file formats, we need to find a proper video to iPhone converter. First and foremost, the converter should be able to output video and audio formats that are supported by iPhone.Secondly, a professional video to iPhone converter should allow users to free choose subtitle and audio track to keep in the output file for a better movie enjoyment. Last but not the least, an eligible video to iPhone converter should allow users to tailor output file, such as video trimming, video cropping, adding watermark, adjusting video effect, etc. 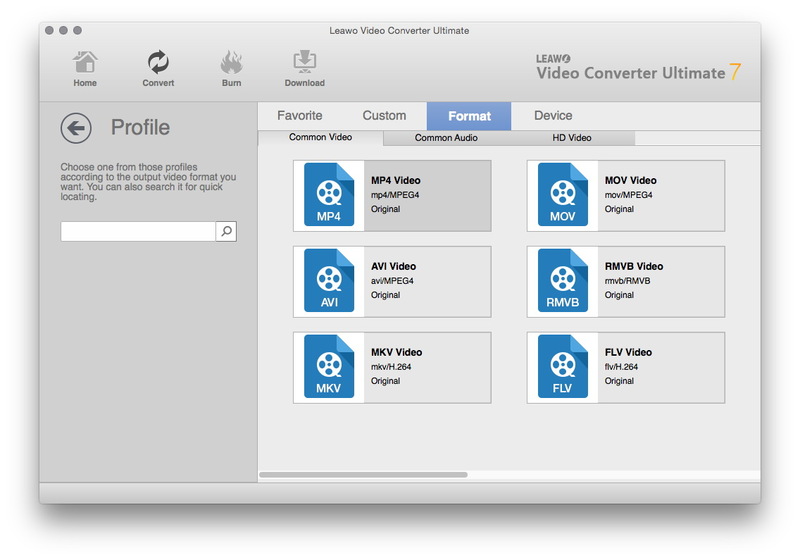 Leawo Video Converter Ultimate is such a video to iPhone converter that meets all the requirements above. In addition, the best video converter for iPhone converter – Leawo Video Converter Ultimate is praised for other features as well(simply showed in the following chart). With Leawo Video Converter Ultimate in hand, it becomes extremely easy to convert video to iPhone. 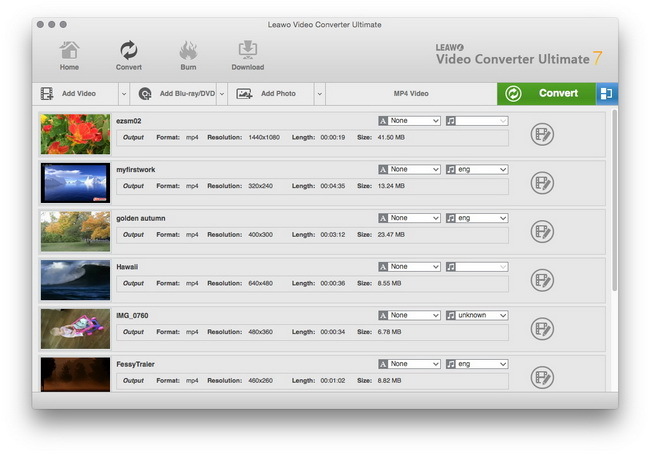 Mac users should switch to Leawo Video Converter Ultimate for Mac to convert videos to iPhone on Mac. 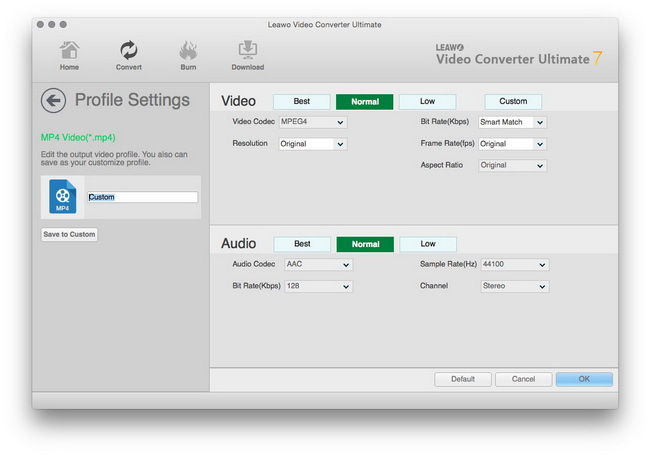 Please download and install the right version of Leawo Video Converter Ultimate before converting video to iPhone. As the main interface of Leawo Video Converter Ultimate for Mac is the same as that of Leawo Video Converter Ultimate, the following tutorial is based on Leawo Video Converter Ultimate for Mac. Windows user can catch a glimpse from the turorial below and follow suit to convert video to iPhone on Windows. Launch Leawo Video Converter Ultimate for Mac, switch to “Convert” module and click "Add Video" icon on the main interface to browse and add source Christmas movies into this iPhone Video Converter for converting. Next to the “Add Photo” button, click the drop-down box (named “MP4 Video” by default) and select “Change” option to enter the Profile panel, on which you could select iPhone compatible profile as output format. You can also directly choose iPhone 6 as the output device. All generations of iPhone model are available for selecting. Click the same drop-down list to change the video and audio parameters of selected profiles like Video Codec, Bit Rate, Resolution, Frame Rate, Aspect Ratio, Audio Codec, Channel, Sample Rate, etc. Back to the main interface, click the big green “Convert” icon to call out the right side bar, on which you need to set the output directory in the “Save to” box. Click the bottom “Convert” button on the sidebar to start to convert video to iPhone format video. After you finish converting, you can connect your iPhone to your Mac, and then start to transfer videos from Mac to iPhone for watching videos on iPhone.